No one would have believed the shy, serious girl would ever stand up in front of a group and speak. But Catherine Booth felt God pulling her to the podium where her husband William preached. Raised with a strong Christian upbringing, Catherine Mumford had developed strong convictions at an early age. Before she was twelve years old, she had read the Bible through eight times. Although health problems kept her at home during her teen years, her father’s demise into alcoholism stirred her to write articles for a temperance magazine. She became an avid supporter of the national temperance society. Her acceptance of Methodist Reformers in 1850 resulted in her expulsion by the Wesleyans. Undeterred, she led a girls’ Sunday school class for the Reformers. In 1851, 22-year-old Catherine heard young itinerant preacher William Booth recite a temperance poem, exciting her with his shared views. Shy Catherine did not speak to William, however. Instead, she sent letters expressing appreciation for his beliefs. Three years of letters passed between the two before the relationship developed into marriage. Catherine joined her husband in the ministry, staying in the background as most wives did. 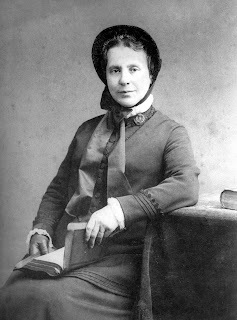 However, inspired by revivalist Phoebe Palmer, a woman whose preaching caused a great uproar, Catherine wrote a pamphlet, Female Ministry: Woman’s Right to Preach the Gospel (1859). The pamphlet conveyed three major principles - that women are neither naturally nor morally inferior to men, that there is no scriptural reason to deny them a public ministry, and that what the Bible urged, the Holy Spirit had ordained and blessed and must be justified. She complained that the “unjustifiable application” of Paul’s advice, “Let your women keep silence in the Churches,” had resulted in loss to the Church, evil to the world, and dishonor to God. And so it was that in January 1860, following the birth of their fourth child, Catherine asked her husband if she could say a word to his congregation, a word that God had given her. William gave his approval and support, announcing that his wife would speak that night. Catherine’s first sermon launched her preaching career. For twenty years, she and William shared a ministry as traveling evangelists, their preaching not done in established churches. Catherine’s preaching gained popularity, even in a world where women had few civil rights. 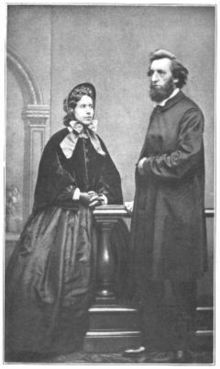 In 1865, the couple began The Christian Mission in London's East End to reach out to the poor and destitute of the city. While William preached salvation to the poor, Catherine spoke to wealthy women, gaining their financial support for the ministry. Leaders of the established church felt threatened by the radical teaching of William and Catherine and sought to undermine their ministry. As a result, William was arrested, but Catherine carried on their work by holding meetings, preaching, and distributing food and clothing to the poor. Many left traditional churches to join the couple’ work by helping to hand out food and going out into the streets to invite people to the services at the mission. To get attention, they often played musical instruments or sang hymns. Catherine thought the mission’s workers needed uniforms and flags to carry, so she made them. 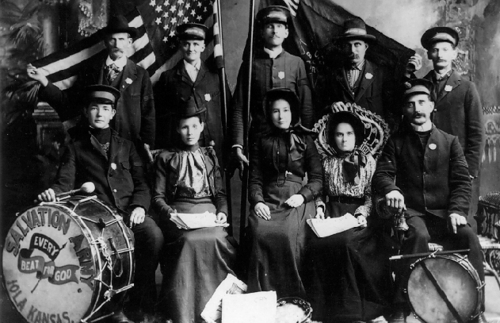 Because they resembled a small military unit, they began to be called the Salvation Army. 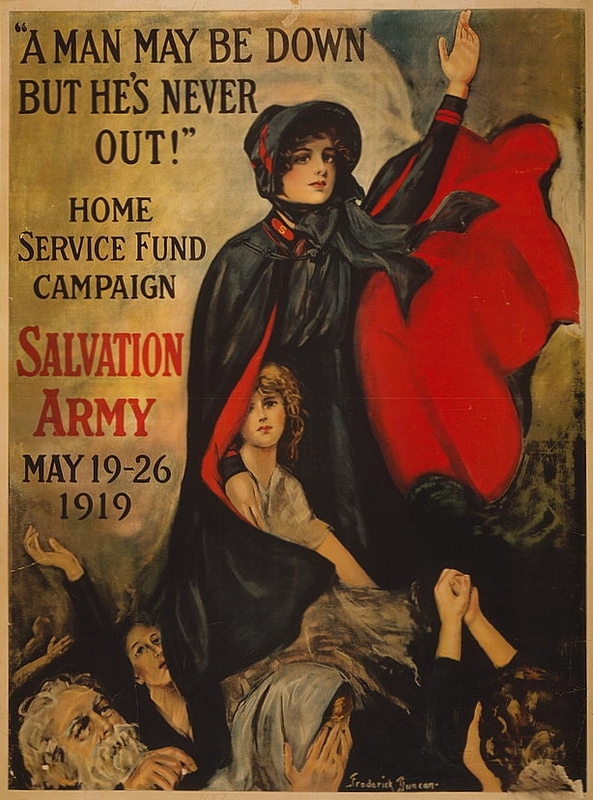 The label may have been meant as ridicule, but Catherine adopted it, declaring “Members of the Salvation Army will fight on, waging war on poverty and injustice wherever we find it.” William became known as the army’s General. The cause gained more support when the press recognized the good they were doing. Newspapers carried stories of Catherine Booth’s Food for the Million shops where the poor could buy a cheap meal and at Christmas, hundreds of meals were distributed to the needy. By 1880, the Salvation Army was one of the most respected Christian groups in London, and soon expended across the ocean where it was welcomed in the United States. Catherine passed away in 1890 at the age of 61, her husband and eight children at her side. Her death was eulogized in the newspapers with quotes from some of her famous sermons. 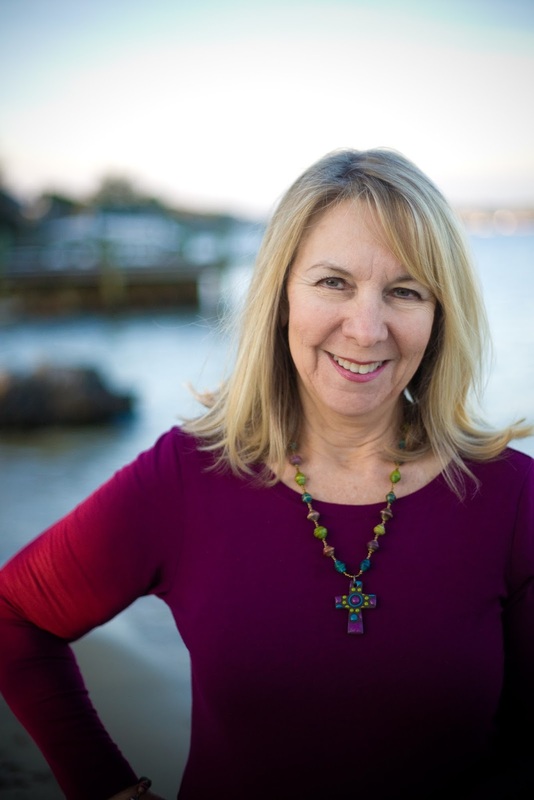 A multi-published author, Marilyn Turk writes historical fiction about the coastal South. Her fascination for lighthouses spawned her popular weekly lighthouse blog @pathwayheart.com, and inspired her upcoming Coastal Lights Legacy series and her Lighthouse Devotions. Her novel, A Gilded Curse, releases March 2016 from Heritage Beacon Fiction, an imprint of Lighthouse Publishing of the Carolinas. 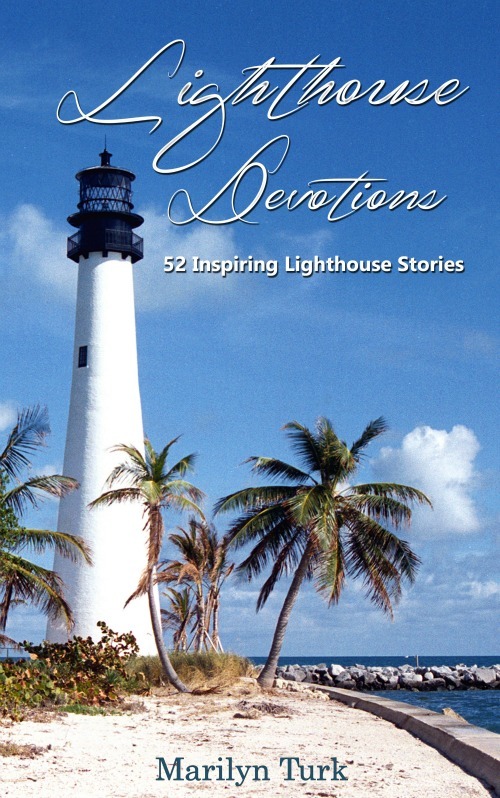 Lighthouse Devotions is a book of 52 inspiring stories about lighthouses and how they relate to God's Word and our lives. Available at amazon.com. Marilyn, My dad attended the Salvation Army college for six months before he felt that going into the ministry wasn't his calling, and he dropped out. While there, he sometimes played his trumpet on street corners to draw a crowd so that someone else could preach to them. The Salvation Army has changed many lives over the years. I'm glad you wrote about it. Vickie, how interesting that your father was part of the Salvation Army and even played in the Army band. Yes, they're still one of the best ministries and have stayed uncorrupted through the years. May God continue to bless their ministry! Thanks for sharing this info about Catherine Booth. I enjoyed learning more about the Salvation Army and their ministry in London when I did research for my book, The Daughter of Highland Hall, which is set in 1912. I wanted my wealthy heroine to be exposed to new ideas and be challenged in her faith, so I had her listen to a lecture given by Booth's granddaughter, Catherine Bramwell-Booth. This was a turning point for my heroine and one factor that helped change the course of her life. The teachings of the Salvation Army were very unique in their day. And as you said, at first they were scorned and ridiculed, but when William Booth died in late 1912 thousands lined the streets of London to watch his casket pass and honor a life well lived. Carrie, our book club read your book in November. It was very good, and we all enjoyed it. I can now see the connection between your hero and heroine to the Booth story! red kettle campaign during the Christmas holiday season. Catherine (and William) Booth's story is quite inspiring! They've left a real legacy. Glad you enjoyed Catherine and William's story, Kathleen. Thanks for reading the post, Sharon. Glad you liked it. Thank you, Marilyn, for this background on Catherine Booth. Her convictions and courage are to be admired. The Booths' legacy is with us today in countless ways. Many benefited from their charitable endeavors then and today. Pat, thanks for your comment. Isn't it wonderful that their legacy has lived on?